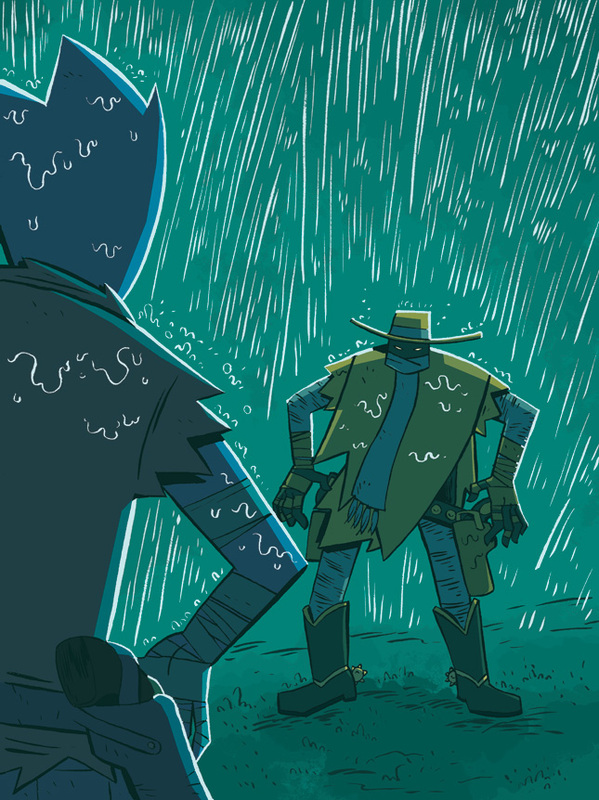 I drew this for the topic "Soaked" over at Illustration Friday. While I'm not necessarily working on the topics as they come up, I am using them as motivation when I'm stumped artistically; picking and choosing the ones I like as I see fit. With this piece, I wanted to try and be a bit loose with my inks. I have a tendency to over think the final inks, so they become a bit more rigid than I'd like. I did this using only a brush pen. I also really tried to simplify the coloring process, as it is the biggest bottleneck for me. This was done with mostly flat colors and the pencil tool. No fancy textures or photoshop tricks. I think it worked out quite nicely. Robots, Ghosts, Cowboys and Monsters!